The sudden sea change in American politics has gutted the emotions and mental state of the Millennials. Donald Trump’s becoming the next President of the United States has wrought incalculable harm to these younger Liberals’ and Progressives’ psyches. It’s a catastrophe of national scale that has crippled colleges, coffee shops, vintage clothing stores, and organic markets. It’s Christmas! Show some charity, empathy, and compassion! Help us Save The Snowflakes! These special, little snowflakes are being cared for by the various colleges and universities and provided with cry-ins, hot chocolate, bubbles, kittens, puppies and ponies, crayons, and Play-Doh among other needed comforts. This has resulted in a financial burden that neither the colleges nor the states can afford. They desperately need our help. That’s right! 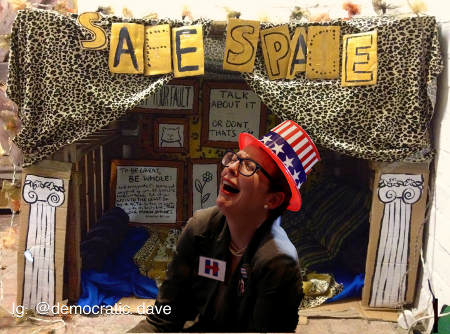 For the price of a pumpkin spice latte per week, you can help these special snowflakes find solace in their safe spaces, far away from microaggressions and campus triggers like conservative ideas, facts, logic, or any opposing views. This entry was posted on Tuesday, December 20th, 2016 at 12:06 pm and is filed under 2016 Election, Humor, Politics. You can leave a response, or trackback from your own site.